I just have to say. 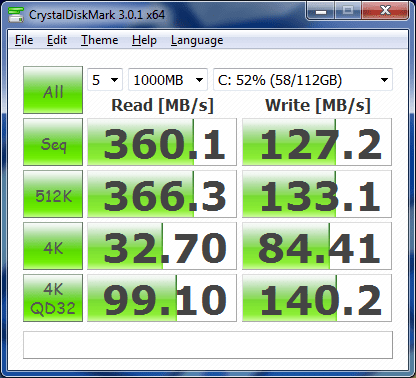 I love SSD’s. I have a HP Pavilion dv6 3030tx. Its not the fastest machine. It is a 1st generation Intel Core i5 540M, with 4GB of memory. If you read the posts on this site I recently upgraded to 8GB of memory. This made little performance difference. I rebuilt my PC with Windows 8 and upgraded to a Samsung 830 256GB SSD. To give you an indication of a general performance improvement, read on. I am a software developer and I do all of my development in Virtual Machines. My current VM platform of choice is Virtual Box. 5. Load solution I am working on. All the above tasks generally take approx 12 – 15 minutes before I am at a working visual studio solution in my VM. As an example it was taking approx 1.5 minutes to reach my desktop alone. The windows performance score was 5.9 with the lowest score being the Hard disk. All of the above tasks can now be completed in under 2 minutes, that’s about a 600% improvement. The windows 8 boot time is unbelievable. I can be at a working desktop in about 15 seconds, including typing my password. Did I also mention shutdown is about 5 seconds. The other noticeable benefit is the improvement in battery life. On my daily 2 hour commute to and from work, I would generally be running below 10% battery and being asked to find power or shut down. Today on a full trip and working the entire time, I still had 40% battery life left. Some of this start up improvement may be coming from the Windows 8 upgrade (don’t get me started on metro…), but its still awesome, I’ve been restarting just to see how fast it is. Don’t throw out your old PC, just upgrade to a SSD, you will not be disappointed. FYI this is what AS SSD showed about my drive in the laptop. 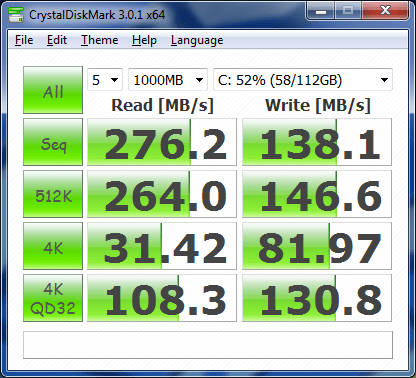 Part 2 of my SSD SATA III performance tests. Is there any reason to buy a SATA III expansion card to run your new SATA III SSD if your MOBO only has SATA II? So I have a shiny new Corsair Force GT 120GB SATA III drive and an old SATA II motherboard. Last article I benchmarked the performance to see what kind of experience you get when running on your onboard sata II connectors. This article is the part 2 where I am going to benchmark the relative performance with a SATA III expansion card to see if there is any point is spending the money on one. 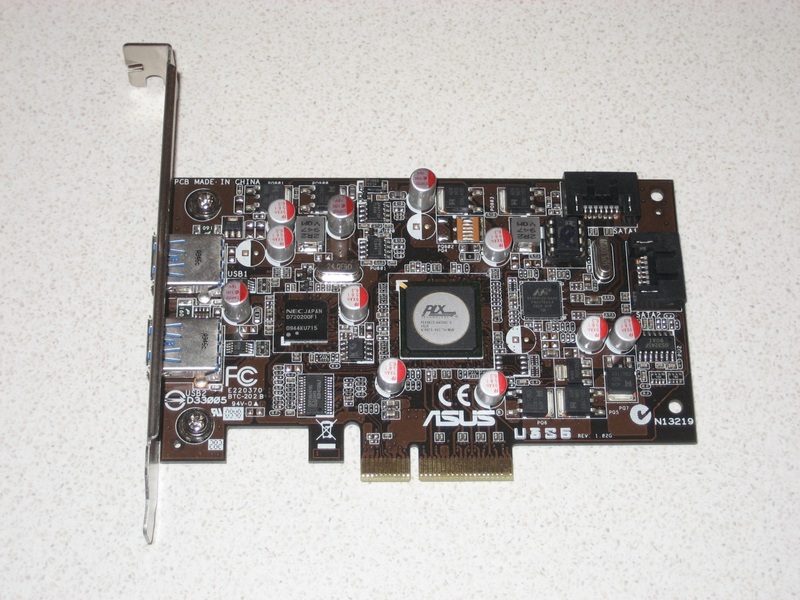 It was a bit hard to track one down in Australia so I had to buy this second-hand off the overclockers australia forums, but I wanted this card for its x4 PCI-e v2.0 connection. Details of the U3S6 here. The S6 = Sata III 6.0Gb/s Marvel 88SE9123 controller. The card has yet to be flashed from its original bios which appears as 1.0.0.1012. I decided to play it safe and rather than flash the bios and destroy the card I would start from scratch, benchmark it first. Later I will play and see if I can improve on stock performance results, buy flashing to later versions of the firmware. The latest drivers are best found on station-drivers. It’s french but version numbers can be read easily, go to the bottom for the MV91xx drivers and firmware. CPU: Core 2 Duo E8400 3.0Ghz, running overclocked @ 4.0Ghz. The U3S6 is a x4 card and will run on PCI-E v2.0. 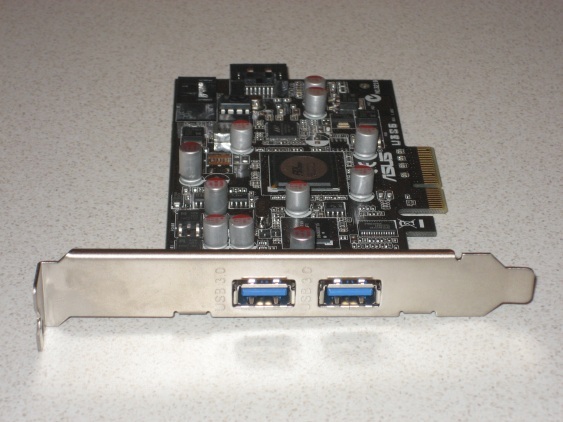 The EP45-DS3 only has 3 x PCI-e 1.0 x1 ports, and has a x16 and x8 PCI-e v2.0 slot. The x16 slot is currently running my MSi HD 6850, and the x8 slot is free. The U3S6 is therefore running in the x8 slot. I was interested in seeing what might happen when running something like crysis whilst having the U3S6 trying to use the same bus. 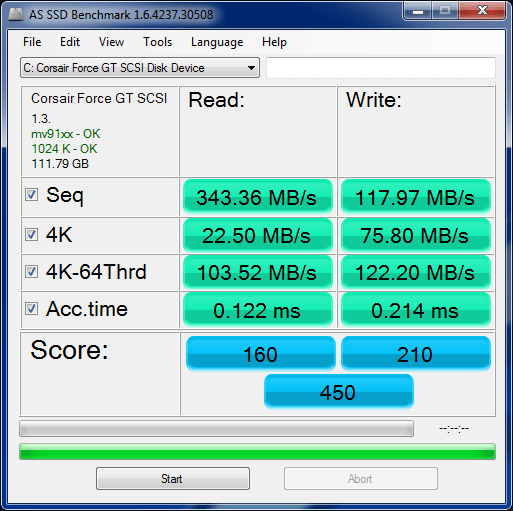 My original SATA II Benchmark score on SATA II was 480! 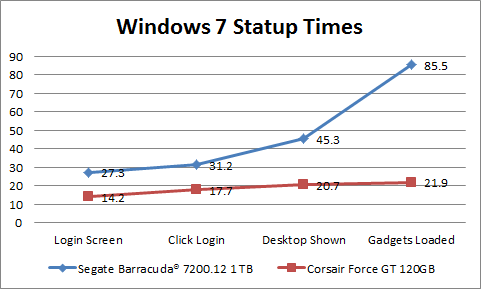 I did this benchmark on day 1 of a clean Windows 7 install. Since then I have been using the computer for a few months and the drive is about 50% full so I benchmarked with AS SSD again. I did numerous benchmarks with in multiple different driver and SATA configurations. The Read speed seemed to give consistent results across similar benchmarks but the write performance (particularly the 4K-64-Thrd) was a bit all over the place and seemed to influence heavily the overall score giving results between 395 and 450. 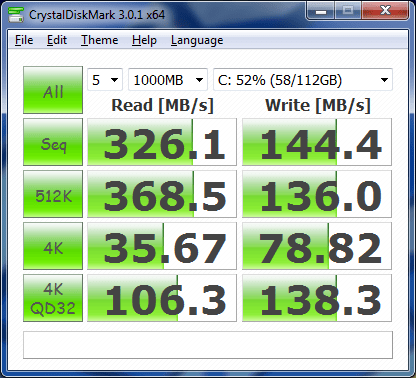 The U3S6 seems to have better sequential read of approx 340MB/s. This is only a 75MB/s improvement. I noted that generally the benchmark results for the earlier 1.0.0.1036 driver were slightly better and more consistent than the later 1.2.0.1016 driver. Also the Read performance was generally consistent but the 4k and 4k-64Thrd write times were up and down. Given the fluctuations I also tried Crystal Disk mark which seemed to give similar results without the randomness. 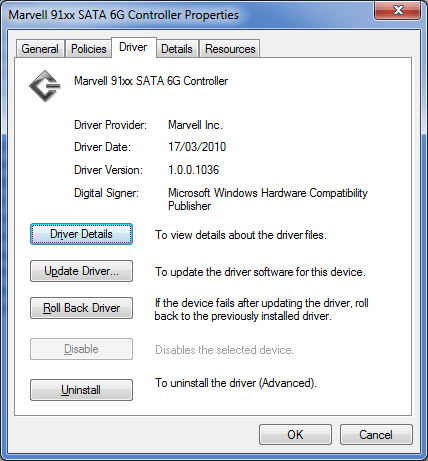 Again the 1.0.0.1036 driver seemed to out perform its older brother. time to see the desktop and the gadgets loaded. 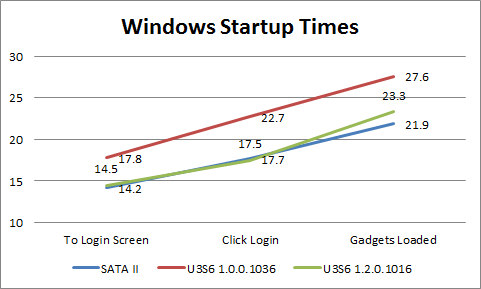 The fastest startup time was still SATA II and the 1.2.0.1016 driver made a difference but the 1.0.1036 was consistently a few seconds slower to boot. The only score to change when running the U3S6 was the Disk from 7.8 to 7.9. Note: 7.9 is currently the maximum rating. I didn’t bother with the load time tests as I figured they would be comparable. 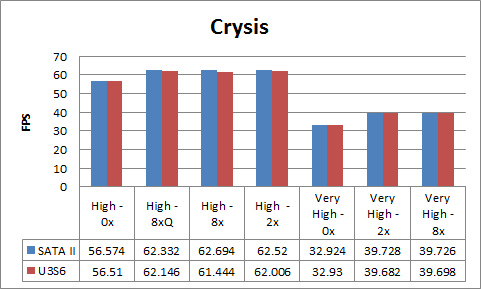 I did however run the Benchmarks for both Crysis and Crysis 2 in the various configurations, with some interesting results. The results were almost identical. No change here. The benchmark was run on DirectX 11 on the Times Square Map. The most interesting thing here is that when the video card was being pushed by crysis 2, the PCIe channel appears to be compromised by the SSD drive running on the x8 port. This can be seen in the poor fps on the two higher settings. Just to see how the USB 3.0 worked I hooked up my Western Digital 1 TB external hard drive and did a 4.14GB and 15.5 GB file copy both up to and down from the External drive. I found the 15.5GB copy onto the external drive took 10m 1s @ USB 2.0 but only took 3m 52s on USB 3.0. The copy down from the external driver took 9m 11s @ USB 2.0 and 3m 43s @ USB 3.0. The copy rates were approx 27.1 MB/s combined for USB 2.0 whilst USB 3.0 achieved 67.9 Mb/s or 2.5 times faster. Nice. PCIe x1 5.0Gbps. x1 why x1, its a x4 card running in a x8 slot? 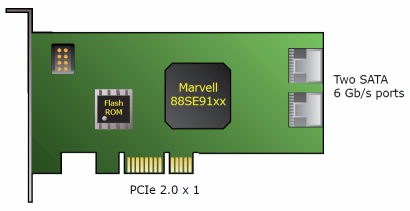 After some digging I found this spec document on the controller, Marvell 88SE91xx Product Brief. If you read this the spec fo the controller shows this.. The controller only supports a single x1 connection. I feel a bit duped. I specifically got this card for its x4 connection, but given the fact the marvel controller only accepts a x1 connection the SATA will only ever be able to run at this speed. I have read other people suggest that the x4 is used to split the channel in half and use some of the x 4 bandwidth for the USB 3.0 controller, which would make sense but it seems like false advertising to me. Overall I think if you are out of SATA ports on your PC and need a few more, then the card is OK as long as you are NOT using it for gaming. The sequential read is slightly better but this is only a benchmark figure as it did not translate in the real world. The only other nicety is the USB 3.0 which will come in handy in the future. will start to appear and these may allow my SSD to run to its full potential as this supports PCIe x2. This benchmark and review is to show what performance differences you can expect when you try to run a SATA 3 SSD on older hardware that only supports SATA II (300 Mb/s) connections. I was recently looking to purchase a SSD drive as an upgrade for my old socket 775 Core 2 Duo machine to keep it alive a bit longer. This meant purchasing a current SATA 3 drive and running it connected via the on-board SATA 2 connection. When attempting to research whether I needed an add-on SATA 3 card I was unable to find any real world reviews of this type of upgrade, so this review is designed to fill this gap. 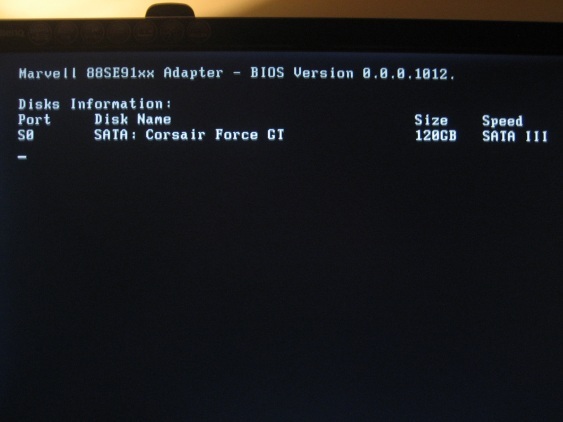 The SSD drive in question is a Corsair Force GT 120GB. 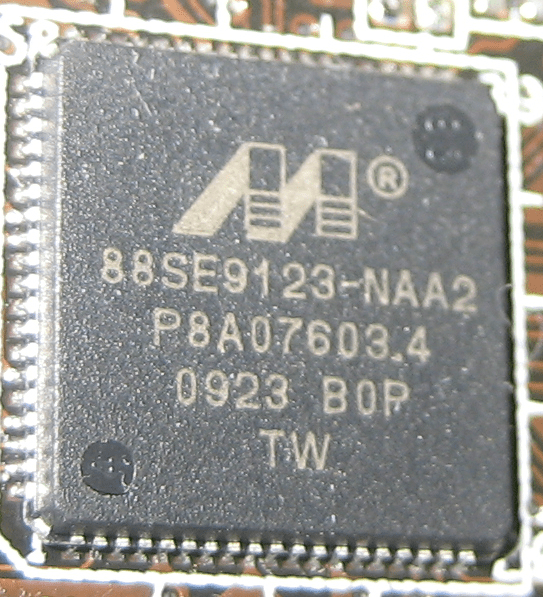 This is connected via the on board SATA II Connection. The theoretical throughput is 300Mb/s. The following is the results of AS SSD. 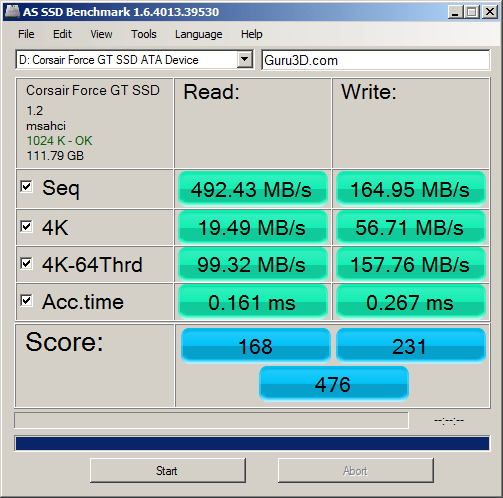 The overall score is comparable with the results from the guru 3d review with the obvious difference being the Sequential Read maxing out at 263Mb/s. 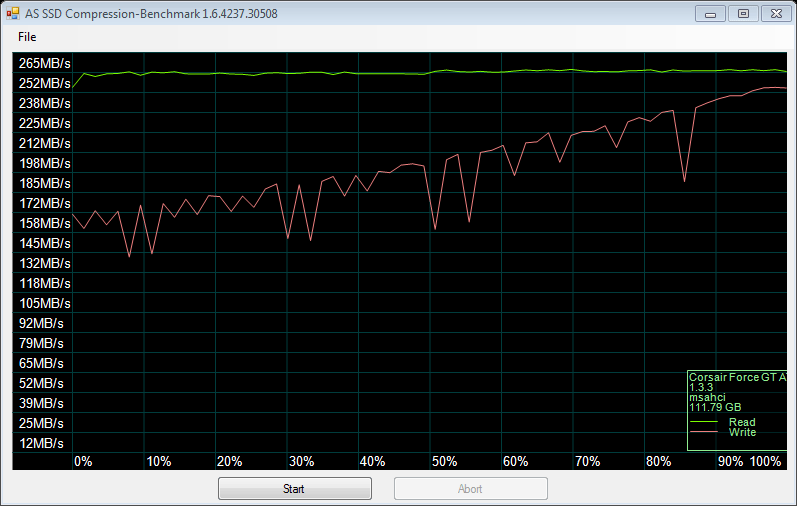 Here is the compression benchmark, so clearly the drive is not being pushed very hard..
time until the gadgets loaded. I timed the loading of the application and the loading of a new game. The load times were generally faster on the SSD drive and seem to have a larger performance gap as we moved from Crysis to Crysis 2. 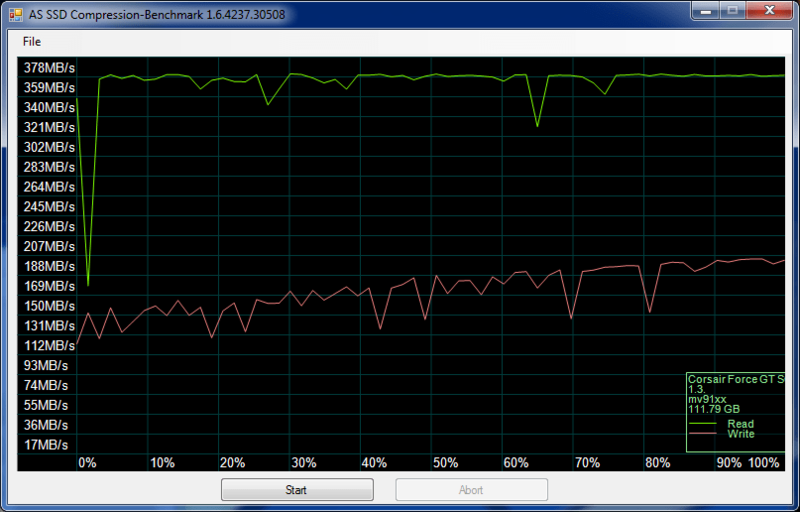 I ran both the Crysis and Crysis 2 benchmarks with no consistent pattern of improvement. The tests were within 2 fps of each other but in some cases the SSD was better and some worse. 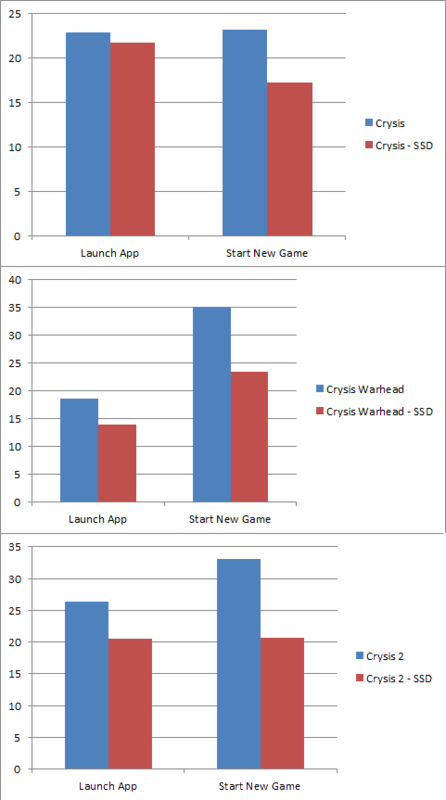 So it appears the Disk has no real impact on Crysis frame rates. The general performance of loading applications like Internet Explorer and Firefox, windows media centre was recorded. In most instances the load times on the SSD drive was around the 0.5 – 2.0 seconds, whilst load times on the hard drive were sometimes comparable but more often they were slower (Browsers took approx 4 seconds to load to Google homepage), but the hard drive was inconsistent in performance with load times as high as 14.5 seconds for IE being recorded. This is a 70% improvement over the Hard drives score. I would say that it was worth the money even with just an old SATA II connection. Also this drive will be a useful addition to my Laptop at some point in the future ;-). SATA 3 SSD with no AHCI? 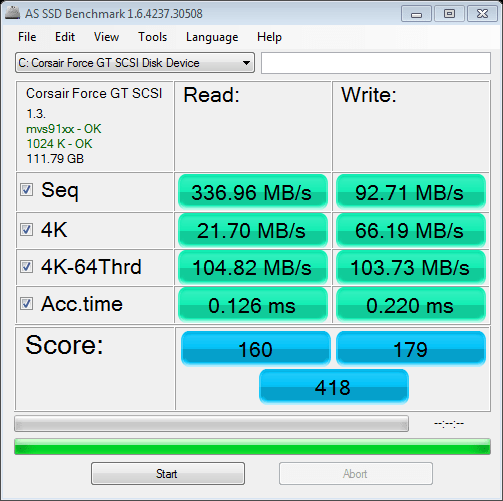 How much of an impact does AHCI have... Can you do a quick AS SSD test with AHCI turned off?? Can you do a quick AS SSD test with AHCI turned off?? Note: similar to the later tests I did on the ASUS U3S6 you notice the read performance score is solid but the write performance is quite variable. So the synthetic performance result is about 40% slower with AHCI off!! Here is what Crystal Mark recorded.. Note again most figures are comparable except 4KQD32. What is 4KQD32 and it is described as “4k 32 queue depth. There are 32 requests in line for 4k of data”. But again these are only synthetic benchmark figures. What did this mean to the general performance of the PC? Windows Experience I re-did the windows experience score and it was identical in all of the measures. Windows Start Up I averaged around 22.5 seconds for the boot time using the same approach to measuring startup time. General Feel The system seemed still quite fast to load apps and not dis-similar to running with AHCI on. 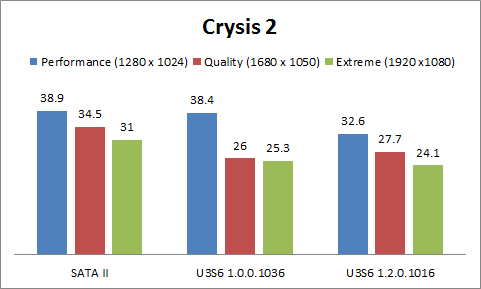 Crysis I re-ran the Crysis Benchmarks and found that the performance was within +/- 1 fps with AHCI on or off. So if you look solely at the synthetic benchmark things don’t look so good, (AS SSD even says its BAD – checkout the screenshot) but in the real world you will notice a significant improvement in boot times, and general speed of your PC. As an example I have a work laptop that is a Lenovo ThinkPad with a Centrino processor and it has always performed really well and I couldn’t work out why it was so good with such a small CPU in it. Only when I did some poking around when writing this post did I find it runs a 60GB SSD.. and it all started to make sense. Firstly, I will start this article by saying, I am a novice overclocker, i.e. this is the first go at overclocking a CPU in anger. On top of that I am one of these people who choose to stay a few steps behind technology because its cheaper, and I can’t justify spending thousands on a new rig every few years. So 6 months ago when my Pentium 4 finally bit the dust I headed to the internet, eBay and various local online distributors and purchased everything to build a new computer, full cost $550 for everything excluding the case which I kept from my last PC. * purchased second hand on e-bay. So here I am wanting to get a bit more performance out of my CPU but the stock cooler will not do. 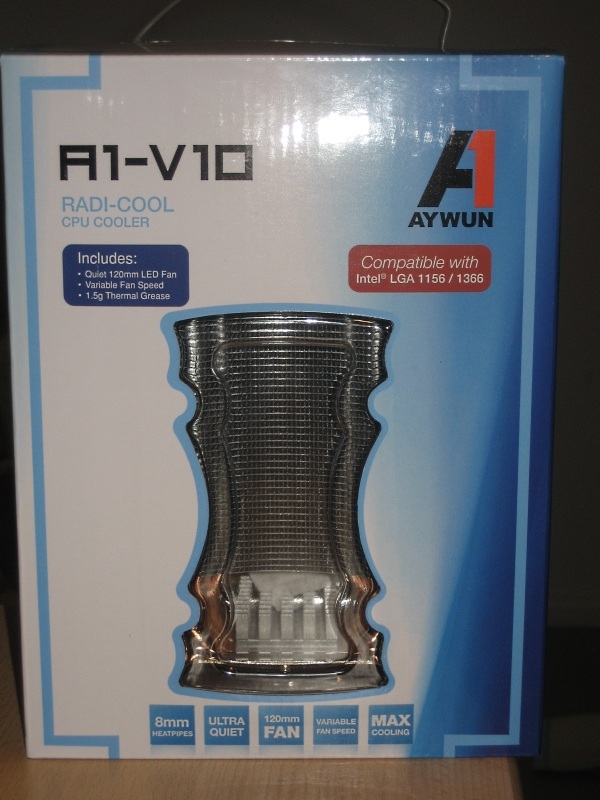 A bit of research was done and I saw the A1-V8 had a few reviews that said it was good for the price, but I could find no reviews about the A1-V10, so thought I would do one for myself. The box says, a minimum 190mm case depth recommended. Fortunately my case is 205mm deep, but it only just fits, so be warned. all the mounting brackets to support the various sockets that it is compatible with. Installation was relatively painless. As mentioned before the unit is big. The fan only just fit in but it does position well with the case fan so you get good ventilation with the Heat Sink fan blowing straight at the rear exhaust fan. I used Artic Silver 5 Thermal paste for the installation. The instructions were in pictures with very few words and I was a bit confused as the backing plate had a clear plastic covering on one side, and I was unsure as to which side was to go up. I put the plastic facing the underside of the motherboard, as the film would have interfered with the screws being able to slot firmly into the notches for the various sockets. I have tested using both the Intel Burn Test 2.5 and Prime 95 @ stock 3.0Ghz, 3.6Ghz and 4.0Ghz. Note: with the stock cooler it was unable to complete the intel burn test @ 3.6 Ghz. I stopped them when they reached 70 degrees. All testing was performed with the Fan Setting on low. I found that the difference between Low and High was generally about 4 degress. I have a case fan that I run @ 1500 RPM, and at the same setting the A1-V10 adds nothing to the noise of my computer. All testing was done with ambient temperature of 17 Degrees. 10 to 15 degrees cooler than stock ! The stock tests were stopped when it reached 70 degrees, even so that is 16 degrees cooler on the Burn Test Std. Also 7 degrees cooler @ idel. With the fan on High these Intel Burn test would not get above 54 degrees. I intend to leave the fan @ 15oo RPM and in this test that raised the temp to 56 degrees. When running overclocked @ 4.0Ghz (25% overclock), the A1-V10 gave results the same as the stock cooler @ stock 3.0Ghz. Have to remove the motherboard to install. Very big, so make sure your case is deep enough. Overall, $43 well spent I say.